A beautiful day, a beautiful prayer from Reverend Judy Parrish, whom I call Father Parrish. She laughs at me but she does that anyway. We’ve known one another for years and like most people called to religious service, she makes light of it but has always tended to her flocks whether they come through the church doors or not. She’s retired now but still serving others. The big news apart from the fabulous weather was the fact that we had Rhonda, Heather, Regan Holland and the grandchildren to see us, as was Anne Seaton. You can’t miss Anne, tall, willowy, bursting with energy. I so like to bedevil her. She takes it in good stride. Anne and Mark Catron were and remain, the driving force behind the Waynesboro Symphony Orchestra fundraiser October 26. Hard to believe, but this is our tenth year. 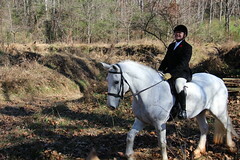 At opening Hunt, Anne presented me with a check for $2000. Thank you, Anne and thank you, Mark. We are honored to be a small part of this remarkable orchestra. Hounds pushed out a fox and ran him to the graveyard by the Cistern. I couldn’t stay behind them as they crossed to the other side of the deep creek by the dying beef barns. Fortunately, Becky Birnbaum was there. By the time I got through a trail somewhat open and somewhat not, he was put to ground but at least we got a bit of music. Open Hunts are rarely barn burners for us and usually they aren’t the best for other hunts either. For one thing, almost all of our opening hunts in Virginia take place during bow season or black powder. The important thing is we are all together looking glorious as did Becky, Kristen Jones, the Field Masters ( Priscilla Friedberg, Sara Bateman, and Susan Boone) and all of you. Isn’t it fun to watch the horses? They know what braids mean and we have some vain creatures in our hunt field. Well, when you look that good, it’s hard to be modest. Here’s to a good season with hopes that the animals will not start marching two by two. I don’t think Old Man Noah will take a pack of hounds. Onward. Do you remember the parable, Matthew Chapter 25, Verses 1 through 12? All ten virgins were invited to a wedding and all brought lamps. However, only five brought oil. The bridegroom tarried. When he finally arrived at midnight, the foolish had no oil. They asked the wise for some oil but were refused and missed the wedding. Sometimes I think our foxes are like those ladies. Some store food and others play too much. They prefer to go out around dusk and come back at dawn. We do not hunt at those times so basically we may be hunting the foolish foxes. I don’t know, but I do know whether we hop a foolish one or a wise one, the animal is smarter than we are. Finally, they have grown winter coats. We watch a few new den, modern architecture, and a few old ones more of the Federal period I think. The fox with the den at the back of Jim Klemic’s dug into the creek bed with other exits and entrances, is quite tidy. She or he lives in sharp contrast to a den not far from my house, which belongs to a hoarder. No doubt this fox, red, will blame groundhogs for the mess but really it’s his. I’ve watched this domestic debacle for years, which is where I got the idea for Uncle Yancy in the Sister Jane books. The current fox must be the grandchild of the original inspiration. Certainly makes one consider or reconsider inherited traits. Thanks to deer season, our game sits tight. We’ve gotten them out a bit but one red, always a good runner, shoots straight to Jimmy Carter’s. Well, the music sounds lovely. We are almost halfway through our season. 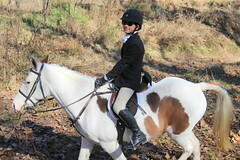 We have just begun formal hunting and we all are hoping for better weather. Hounds like to hunt and so do I, so we go but the footing is deceptive. Surprisingly, in some places it is solid. However, mostly not. This is a mess for all of us and I swear you can hear that mud sucking off your horse’s shoes. Some of you have asked if you can wear raincoats as I have been going out in all but heavy rain. As long as it’a not hot pink, go ahead. As to water sliding down your boots, I know of no solution to that. Let’s hope for the best. We will be able to return and vigorously hunt our fixtures now hosting hunt clubs and hunting parties. I hope they have a good season as we are overrun with deer. Fortunately, I work on that when puppies are puppies. Even our young entry are hitting their stride. When first a deer shoots out in front of them, they either stop cold or run after it. Seeing that they are alone or only with another youngster, they come back quickly. Often, no whipper-in is needed. The other hounds chastise them, which is really more effective than if I do it. I will do it if I am encountering a hardhead, but in the main I let the hounds do their own policing. I’m surprised that our member numbers are growing despite the weather. Usually in bad years, there’s a downtick. Not this year and I credit that to the extra special events, continued glorious tailgates, and general good cheer. The season hasn’t been dreadful but it’s hard for hounds and staff in a monsoon. This makes me think most of our foxes are wise virgins, so to speak. They aren’t coming out in this stuff. Anything about hunting, I read and re-read. Re-reading Henry Chapin’s memoirs, a very rich and good Master, English. Have read everything I can find about Tom Firr, Fred Findlay, Ikey Bell, and other outstanding huntsmen from the 19th and 20th centuries. Have unearthed some old books about a few notables from the eighteenth century. So should you come across a diary, whether printed (those with funds often did so) or handwritten, usually in a leather bound book, I will pay for it and your efforts in finding same. I can’t get enough. I even keep old pedigree notes. .Hey, you might find another Squire Obaldeston’s Furrier. Learning keeps me going. For instance, Mr. Pip has white spots. He’s polka dotted. That coat goes back to an English Thoroughbred, Birdcatcher of 1833. 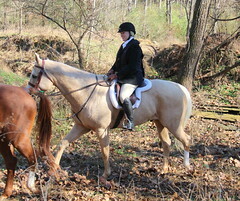 Mr. Pip is a Saddlebred, but Saddlebreds are a good 80% Thoroughbred. I you have materials but don’t wish to sell them, if you allow me to borrow same, I will return within one month in perfect condition. I put such things in a drawer so the cats can’t read them. Enough. 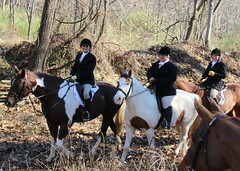 The William Woods girls and one professor, Michelle Smith, rode well, covered a lot of beautiful Virginia and Laura Hayon, whipping-in with Becky Birnbaum, saw a bear. Professor Laura Ward rode in the truck with John and couldn’t stop talking about it. She had such a good time. And now to thank Marion Maggiolo of Horse Country who once again went over the top. She arranged for tickets to the Gold Cup. She had a tailgate organized with tables, food, everything. And for each young lady, she had a bag containing clothing and items they could use. I told her I would pay for this as it really is an awful lot. She wouldn’t hear of it. She has done this for the girls each visit and she won’t take a thing. 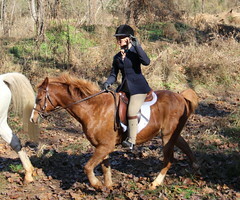 Marion says she loves seeing young people learn about foxhunting and she knows William Woods teaches all four seats. When you see her, for surely you will go to Horse Country to buy some elegant Christmas presents, thank her.